Regular readers of this blog will no doubt know that I’m a big fan of networking, connectivity and remote control. I like it when I can get computers to do the boring stuff so I get to do the fun stuff. This post is another installment in that series. Today, we’re talking about how to send MIDI commands over your network. We’ll leave the what and why for the next post, and today focus on the how. Sitting on my DiGiCo SD8 is a 17”MacBook Pro. In between the MBP and SD8 is a MOTU FastLane MIDI interface. I go out of the SD8, in to the FastLane, which is connected via USB. The MBP becomes the “master sender” (that’s a technical term I made up) for the rest of the network. The MBP is connected to my Sound network via Ethernet. We have a Mac Mini at FOH that does a bunch of stuff, but for this exercise, it runs a DJ app called Mixxx. What’s cool about Mixxx is that it can be controlled by MIDI. Also in the tech booth is another Mini that is Bootcamped into Windows 7, and runs the Hog 4PC lighting controller. That Mini also connected to my Sound network (via wireless for reasons that are beyond the scope of this article). Further down the the booth sits our Mac Pro running ProPresenter with the MIDI module. That Mac is connected to our regular in-house network. However, because the Sound network is NAT’ed out to the house network, we can still get MIDI signals out there. So that’s the basic layout, here’s how it works. When we set up a session, it looks like this. I've named this session MIDI Master so I can easily tell it apart from others on the network. To start, click the + under the My Sessions window. You can name it whatever you like, but I suggest naming it something useful, like the computer name or a nickname you’ll remember. You can also specify the Bonjour name, which just makes it easier to make sure everything is connected. Once everything is named, click on “Enable” to make it active. Now go around to the other computers you want to connect and do the same thing. Keep the names discreet so you don’t loose track of what you’re doing. Once you have everything active, you can simply start connecting the “nodes” to the “master.” From the node, select your master computer from the Directory, and hit connect. Here, you can see the other computers on the network, and I've connected to the Hog PC. Any notes generated on my MIDI Master will be sent to the Hog PC right now. Sadly, not all of our production gear runs on Mac OS. Sometimes, we need to suffer in Windows. But all is not lost. Some enterprising young man wrote a little program called RTPMIDI that basically does exactly what the Mac OS MIDI network stack does. He even copied the dialog box exactly so set up is exactly the same. I loaded this up on the Mini that we use for the Hog and it locked right up to the MBP master. Because it uses Bonjour, connecting is usually as easy as waiting for the node to show up in the dialog box and hitting connect. If Bonjour gives you trouble, you can also enter an IP address to connect directly. Generally, the connections will re-establish themselves after a power cycle, but sometimes they don’t. It’s become part of my normal workflow to go around and make sure everything is connected after we power up all the computers each weekend. Oddly, the RTPMIDI Windows computer connects the most reliably. I can usually connect the ProPresenter Mac from the MBP, but the FOH Mini fails to connect when I do that way, so I have to go to the Mini itself and connect back to the MBP. I’m not sure why. Once it’s all connected, it works quite well, however. Once you do all this (and it actually only takes a couple of minutes to configure and a few seconds to connect everything), what is going on? Well, basically, any MIDI notes that originate on any computer will be sent over the network to every other node on the network. So I can now send MIDI commands and notes from the SD8 to any computer in the booth. But there is a catch. Or more correctly, something to generate the MIDI notes. Or perhaps even more correctly, something to get the MIDI notes coming in from the SD8 via the FastLane to go out to the network. 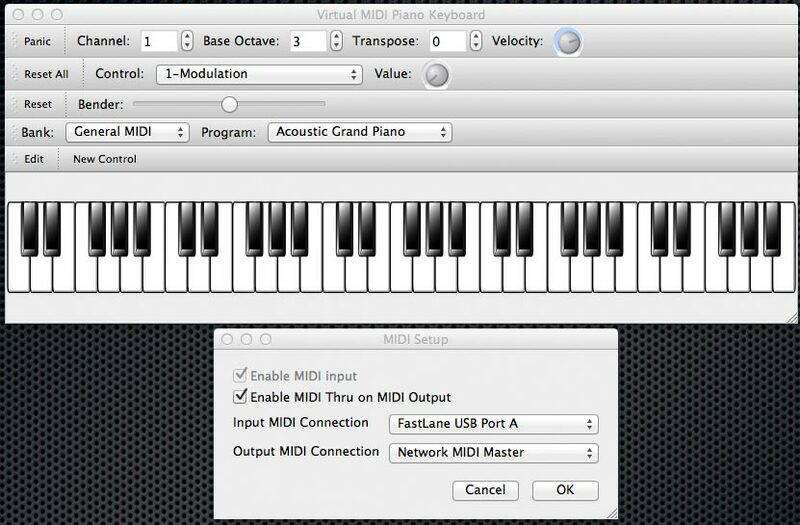 I have to try it, but I think MIDIPipe would do this, but I ended running a small, free program called VMPK (Virtual Midi Piano Keyboard). Basically, I tell it to listen to MIDI commands coming in from the FastLane and send out MIDI to the network. It doesn’t do anything else but pass notes through. The only think VMPK does is take notes in from the FastLane and sent them back out to the network. 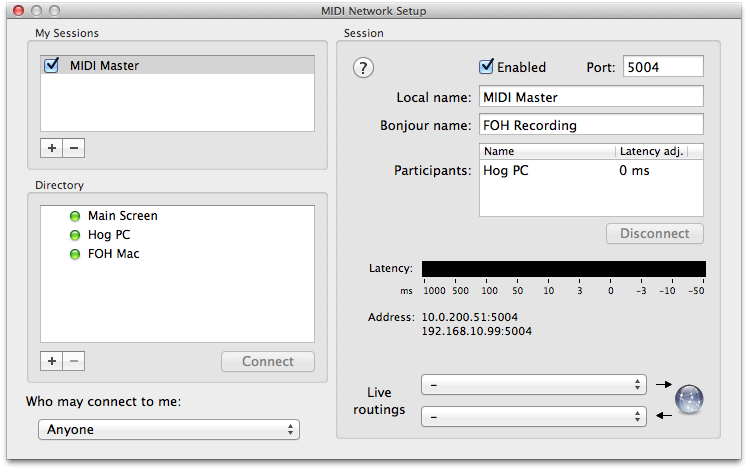 Note that the output name is Network MIDI Master, which is the network session we set up earlier. I have this set to launch automatically and hide, so we don’t even know it’s running. It just sits there in the background and sends notes along to the network. Yes, it took me over 1,000 words to describe the process, and I spent a few hours getting it all figured out. But now that I’ve done the hard work, it won’t take you more than a few minutes to get it all working. And once it is, what can you do with it? If you’re like me, your mind is already racing with possibilities. If not, stay tuned for the next post and I’ll tell you what we’re doing with it.